Have you ever heard the phrase "Mad as a March Hare"? Since you're here, we assume that the answer might just be a big "yes." You're always mad for tea time (which, as for as you're concerned, is anytime), and you also like hanging out with friends who literally have "mad" in their name (the Mad Hatter, of course). So is there any headwear that could possibly be more appropriate for capturing your zany spirit this Halloween than this March Hare hat? We think not. That's why we strongly recommend this Adult March Hare Hat for your next trip down the rabbit hole and into Wonderland! 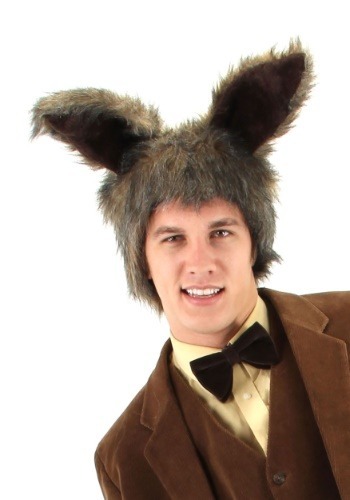 This 100% polyester hat is covered in wild fur which captures the Alice in Wonderland character's wacky sense of style. The interior features cloth so it's comfortable, plus it's adjustable too so it will fit all heads. Pop it on and hop off to meet Alice. With a set of wild rabbit ears and a thicket of crazy, unkempt rabbit hair, there'll be no doubt you're as mad as they say you are when you show up to the next tea party wearing this awesome adjustable hat. Whether it's Halloween, tea time, your birthday (or even your unbirthday), show your crazy streak with this Adult March Hare Hat!